One of my most favorite meal themes is breakfast for supper. I love breakfast food! Pancakes, waffles, omelets, French toast, hashbrown casserole, you name it. The biggest reason that I enjoy eating it for supper is probably because that’s about the only time I indulge in these foods. Sure on an occasional lazy Saturday morning or Sunday brunch I’ll break out the breakfast food. but it doesn’t happen very often (try never!) on a week day morning. This evening for supper Breakfast is what Jake and I enjoyed. Waffles (for the first time ever in our new waffle maker) and scrambled eggs to be more exact. Yum! It’s the little things in life that matter most! What does one do with all the leftover yarn from all the projects completed throughout the year. The girls and I decided to start making items to give away. 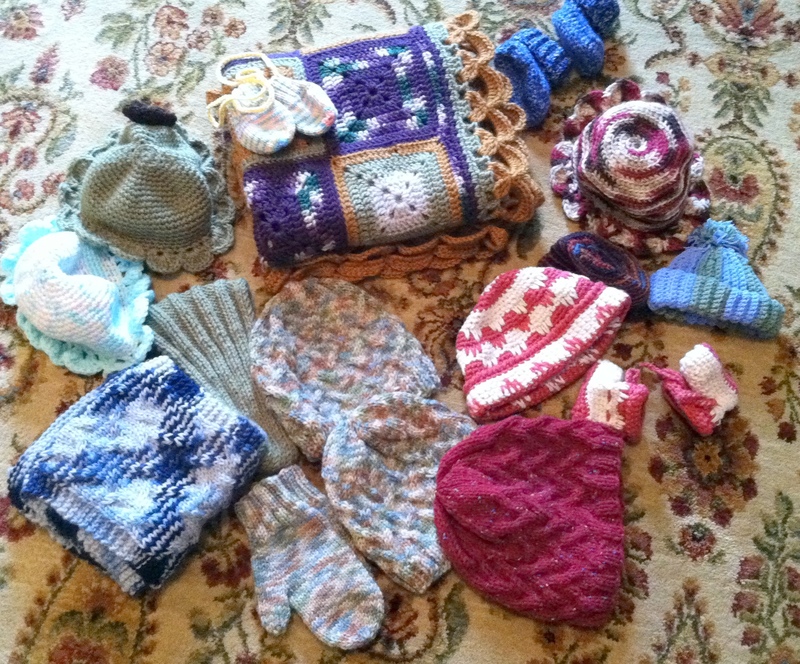 We made hats, mittens, booties, scarves and even a granny square blanket. We gave some to friends and family and then realized our items would be perfect for the local crisis pregnancy center – “The Collage Center.” They could give our items to women and their babies. We were so excited to give them and look forward to making more items to give away. And this time it won’t be from the scraps. I have a few projects in mind and will share with you later. Valentine’s Day is 1 month away! I’ve noticed that wreaths are very popular these days and decided to jump on the band wagon. Here’s my version of a Valentine’s wreath. It even coordinates with the table runner in my post yesterday! 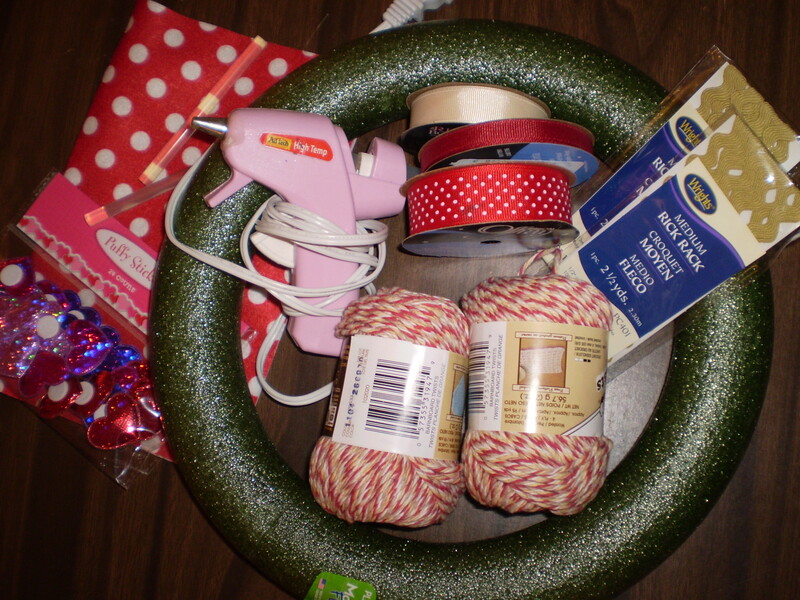 I started by tying the yarn around the wreath as tight as I could without making an indent in the styrofoam. I put a dot of hot glue on the knot and let they dry . This would hole the yarn in place. I wound the yarn tightly around the entire wreath – this was by far the most time consuming part! 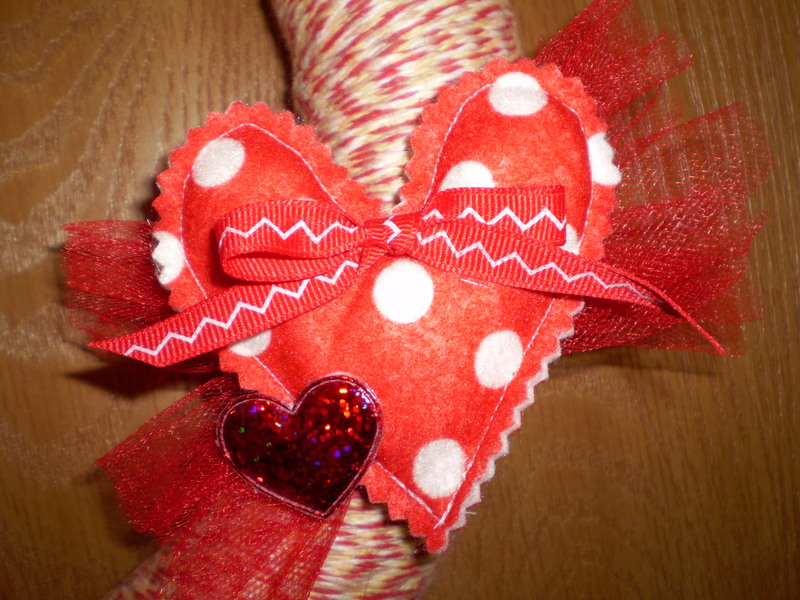 I secured the tail of the yard right next to my original knot – and you guessed it – another dot of glue. My attached embellishments were attache atop this spot too. That way everything was concealed. I made a felt heart and stuffed it with tissues – it’s just what I had on hand. I pinked the edges to finish them off. 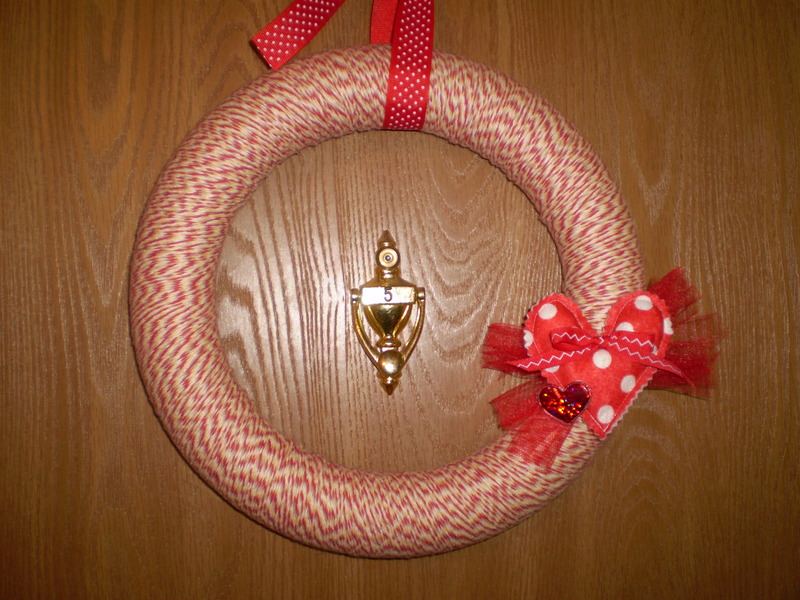 Because I wanted my wreath to hand lower out of the way from the knocker and the peep-hole, I attached it to the wreath hook with coordinating ribbon tied in a bow. I’m happy with my first wreath. It was so easy I just might do it again for another holiday or occasion! With all those Christmas decorations taken down, the apartment feels a bit empty. I want to jazz it up a bit for other holidays throughout the year. Here’s my latest project – A reversible table runner. I chose vintage looking fabrics that I though coordinated well. And to help them stand out I made a scalloped edge (which I made a pattern for myself from graph paper – so proud!) in another coordinating fabric. 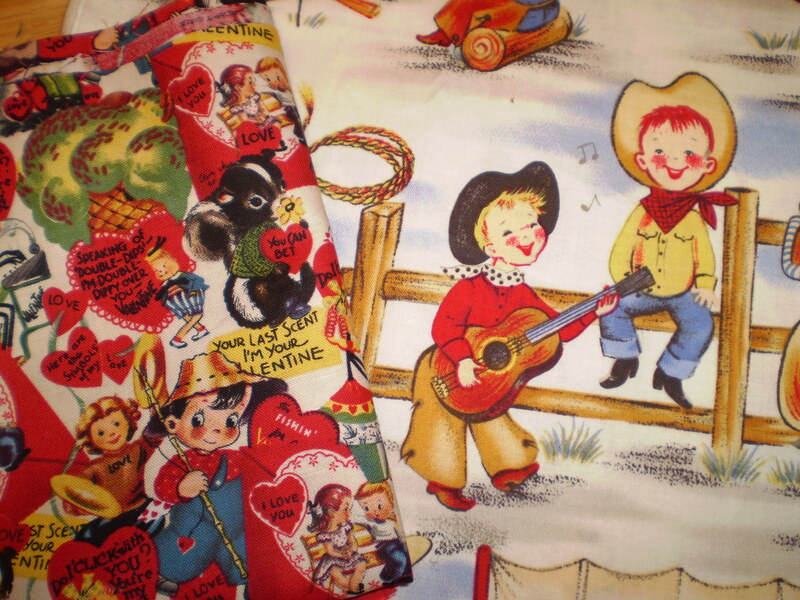 I used the 1/3 yards of fabric as is – no cutting (unless of course they came off the bolt really crooked!) And cut 2 scalloped edge pieces from the 1/2 yard of each of the coordinating fabrics. I attached the scallops to the 1/3 yards on both ends and then put rights sides together and stitched ’em up leave a 3″ hole to turn right side out. I top stitched around the whole thing. 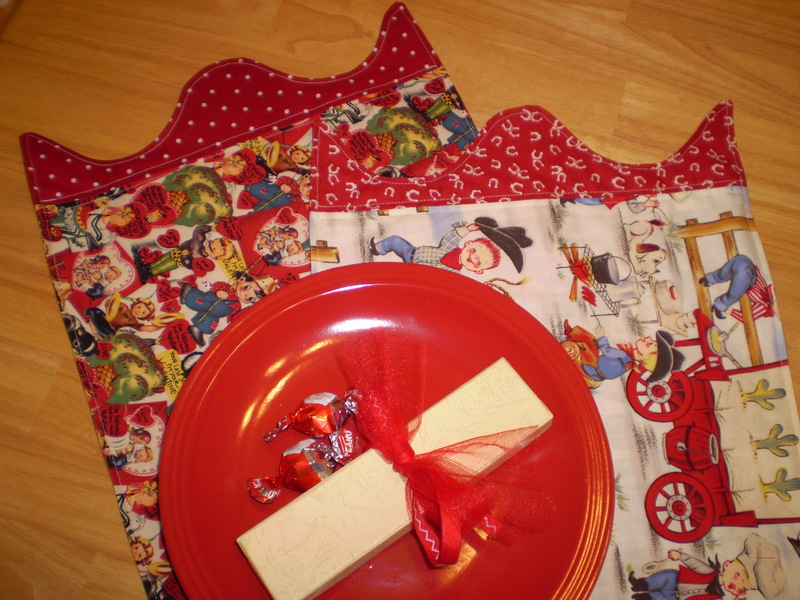 Now I’ve got 2 new table runners out of one “sew-simple” project! 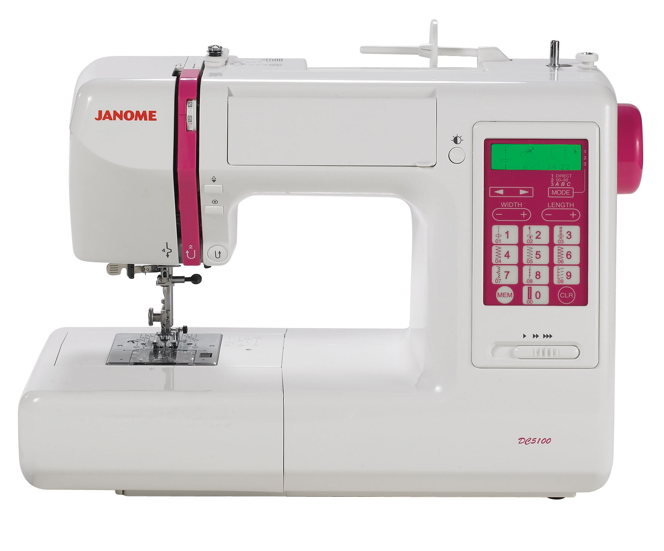 I am the proud new owner of a JANOME sewing machine! I’ve upgraded tremendously from the cheap sewing machine I have been sewing on for the past few years. I used some of my graduation money to reward myself. I think this new machine will make all the difference on my sewing projects! It has so many different features that were not available to me on my previous machine. I’ve been setting up a sewing corner in the living room and look forward to sharing a few sewing projects with you in the future! Sorry for the crappy lighting – it gets dark so early here, and there is not a great place to take photos in the apartment. 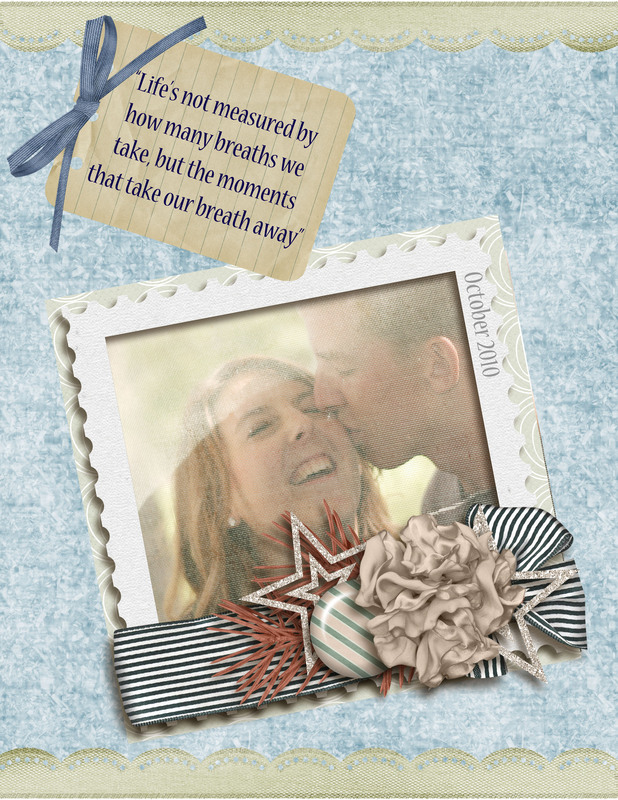 I used my newly acquired digital scrapbooking skills to put this baby together with some romantic papers and elements. Then I added some paper punches inside the ornament to mimic snow and for a little whimsy. I love the way it turned out! 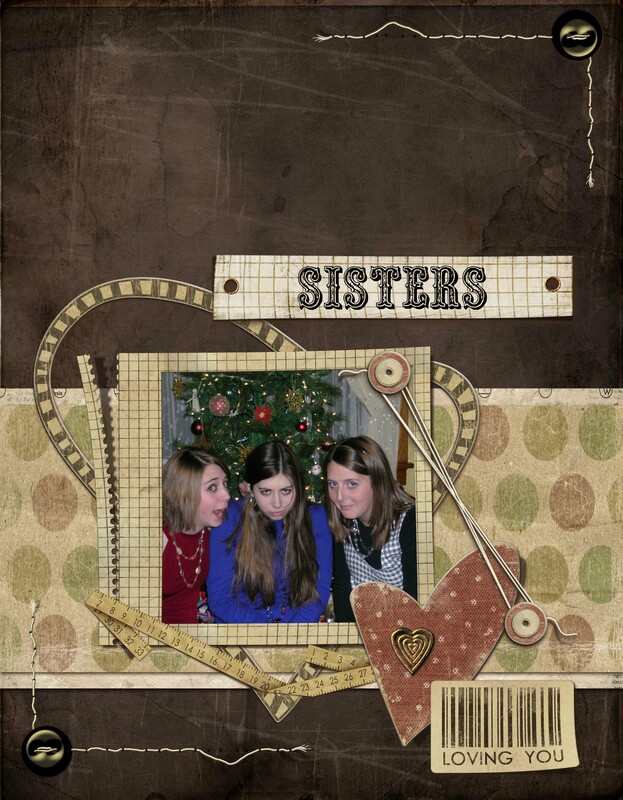 I have something exciting to share…I’ve completed my first digital scrapbooking page! I have spent a couple of days accumulating scrapbook goodies and reading up on how to use my Photoshop to put my layouts together. I’m proud to reveal my first page – it’s nothing fancy, but it sure beats the old way. The end of last year was full of changes for me. The biggest being my graduation from UNL. The real world is approaching ever so quickly. I will be entering the field of education within a few weeks. I have a long term substitute teaching position lined up for a good portion of this semester. (It’s funny how when you are in school – and your profession revolves around the school calendar that you measure the year in semesters and it begins in August and ends in May!) Having spent all of Christmas break away from our apartment I’m spending my time off putting things back to normal and crossing some projects off my list! Take more pictures! As I was thumbing through pictures on my computer I realized that the last pictures I’ve really taken were those of Jake and I on our honeymoon. I used to take a ton of pictures in high school. My days there are practically lived out in my iPhoto. Pictures spark memories…and although I still have a good memory now it might not always be that way. Jake and my first Christmas as husband and wife has come and past…and gone undocumented. So this year I’m going to dig out my camera and snap away. Start Digital Scrapbooking Here’s yet another reason I need pictures…I might be a little late to jump on this bandwagon, but digital scrapbooking seems a lot less time consuming and a lot more cheap that actually using paper. I have started collecting freebies off the internet and hope to start experimenting with wedding photos. I think this will be a fun way to share with friends and family…all I need to do is print another copy. Blog Did I already mention this? I have a lot to share and a lot of ideas…they just never seem to make it here. All those posts when I say to check back for more detail and they NEVER appear…that’s probably an unfinished project waiting to be finished. Or life got too busy and I never followed through with my post – so Blog more.